Enhanced recovery after surgery (ERAS) pathways represent the optimal approach for patients undergoing colorectal surgery. Elderly or low physical status patients have been often excluded from ERAS pathways because considered at high risk. The aim of this study is to assess the adherence to ERAS protocol and its impact on short-term postoperative outcome in patients with different surgical risk undergoing elective colorectal resection. Prospectively collected data entered in an electronic Italian registry specifically designed for ERAS were reviewed. Patients were divided into four groups according to age (70-year-old cutoff) and preoperative physical status as measured by the ASA grade (I–II vs. III–IV). Adherence to 18 ERAS elements and postoperative outcomes were compared between groups. Regression analysis was used to identify independent factors associated with improved outcomes. 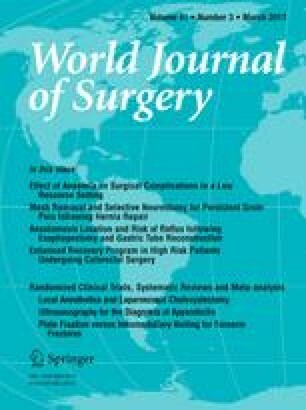 Eleven Italian hospitals reported data on 706 patients undergoing elective colorectal surgery within an ERAS protocol. Patients with low physical status had reduced adherence to preoperative carbohydrate loading, epidural analgesia, PONV prophylaxis, and early urinary catheter removal. No difference was found between groups for adherence to other perioperative elements. Major complications occurred in 37 (5.2 %) patients without significant differences among groups (p = 0.384). Median (IQR) time to readiness for discharge (TRD) was 4 (3–6) days, length of hospital stay (LOS) was 6 (4–7) days, and both were significantly shorter by only 1 day in the groups of younger patients (p < 0.001). At multivariate analysis, laparoscopy increased adherence to ERAS items and reduced TRD, LOS, and morbidity. A high ASA grade was significantly associated with lower adherence, whereas older age significantly prolonged TRD and LOS. ERAS pathway can be safely applied in elderly and low physical status patients yielding slight differences in postoperative morbidity and time to recover. Laparoscopy was independently associated with increased adherence to ERAS protocol and improved short-term postoperative outcome. Luigi Beretta MD (Department of Anesthesiology, Vita-Salute University San Raffaele Hospital, Milan), Stefano Bona MD (Department of Surgery, Humanitas Hospital IRCCS, Milan), Roberta Monzani MD (Department of Surgery, Humanitas Hospital IRCCS, Milan), Marco Azzola MD (Department of Surgery, Cantù Hospital), Andrea Muratore MD (Department of Surgery, Candiolo Hospital, Turin), Michele Crespi MD (Department of Surgery, Luigi Sacco Hospital, Milan), Riccardo Iuliani MD (Department of Surgery, Cottolengo Hospital Turin), Carlo Bima MD (Department of Surgery, Cottolengo Hospital Turin), Hedayat Bouzari MD (Department of Surgery, Mauriziano Hospital Turin), Andrea Pisani Ceretti MD (Department of Surgery, San Paolo Hospital), Luca Pellegrino MD (Department of Surgery, Cuneo Hospital), Marianna Maspero (Department of Surgery, Vita-Salute University San Raffaele Hospital, Milan), Umberto Casiraghi (Department of Surgery, Vita-Salute University San Raffaele Hospital, Milan), Ferdinando Ficari MD (Department of Surgery, Careggi Hospital, University of Florence).